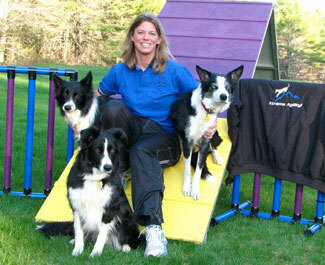 Anne’s goal is to improve the all-important ‘connection’ between dogs and handlers. The focus is on teaching you to be the trainer and handler that your DOG needs you to be! Students learn to understand the ‘pressure’ a dog feels from various obstacles, ring set ups, and even from us! The use of ‘directed energy’ is taught to improve the connection and relationship between you and your dog. Anne promotes a healthy, happy and mutually understanding relationship between you and your dog, one that will take you as far as you wish to go, whether that be international level competition or fun at home in the backyard!